A useful guide to Scripture that fits both your pocket and pocketbook. 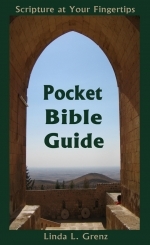 The Pocket Bible Guide provides readers of all sorts --from those who know nothing, to those who think they know everything, about the good book--with all the basic information they will ever need, in a user-friendly format. Once you pick it up, you will wonder how the author packed so much indispensable information into such a handy little pocket-size paperback. And best of all, it takes the fear and confusion out of reading the Bible. Beginning with answers to questions like, "What is the Bible? ", the guide gives highlights of each biblical book. It introduces several ways to read and study Scripture and supplies thumbnail sketches of well-known people and places in the Bible, for a better understanding of the biblical world. An indispensable Glossary of Key Terms defines Scripture's most common words and concepts. And for those interested in history, a Timeline situates the Bible in its place in history--from the dawn of civilization through the end of the first century A.D. Similarly, maps of Bible lands place biblical events in geographic context. Readers find personal comfort and enrichment in the sections for Finding Help in the Bible and an annotated list of Tools for Bible Study rounds out this amazing companion to the Bible--it unlocks the treasures of the Bible. A short description of content of every book in the Bible. An outline of the book. A list of famous passages in each book. Helpful aids to study the Bible Several Bible study methods. A list of passages for finding help in the Bible. Lists of people, places and key terms Timelines and maps. "This was a religious best seller under Doubleday and now, under LeaderResources, which the author The Rev. Linda Grenz founded, we get to expose yet another generation to this invaluable resource. Youth, love it. And in our age of Biblical illiteracy, adults would be well advised to rush out and buy it. Having headed the College of Preachers, I will candidly admit, that I turn to it as a part of my sermon preparations to refresh my memory, and to get me unstuck when the commentaries and my prayers don't seem to get me connected to The Holy One!" The Rev. Howard Anderson, Ph.D., Former Director of the College of Preachers at the Washington Cathedral. Linda L. Grenz is an Episcopal priest who has served in parish ministry and as the Adult Education, Leadership and Lay Ministry Development staff person for the Episcopal Church. She is also the author of Transforming Disciples, The Guide to the New Church's Teaching Series and, with her husband, Del Glover, of The Marriage Journey. Linda has also written several curricula, the most recent being the Godly Journey.She holds an MTS in Old Testament from Harvard Divinity School, an MDiv from the Episcopal Divinity School and a DMin degree in Postmodern Church from Drew Theological School. She currently serves and the Canon to the Ordinary in the Diocese of Rhode Island.